NCVPS is constantly evaluating our offerings and their impact on school needs. Over the last few years, we have seen our Credit Recovery enrollment decline as school needs have changed in this area. During the 2016 – 2017 school year, we worked with our Advisory Council and other NCVPS stakeholders to reflect on our Credit Recovery offerings and impact for schools. After careful consideration of this feedback from our stakeholders regarding our Credit Recovery offerings, we have decided to discontinue our Credit Recovery offerings beginning Fall 2018. Our last Credit Recovery offering will be Summer 2018. 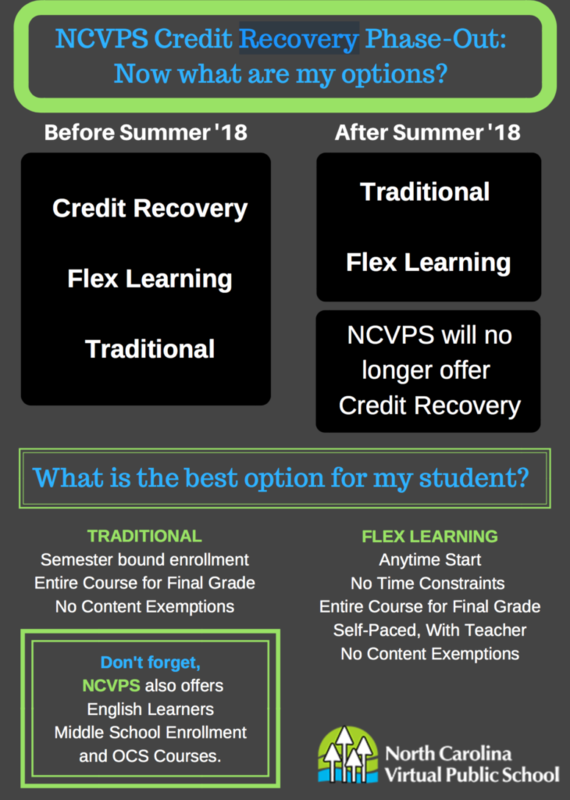 NCVPS will continue to offer Credit Recovery courses through Summer 2018. Beginning Fall 2018, students needing to retake a course will have our Traditional and FLEX Learning programs as offerings (not as credit recovery but to repeat the entire course). If a student needs a flexible start/end date and a self-paced option, FLEX Learning may be the best fit for repeating the course. If a student needs a set start/end date (aligning to the semester), then our Traditional option may be the best fit for repeating the course. Students will receive a final grade with both the FLEX Learning and Traditional options as all parts of the course with no exempting of content will be required. For more information, please visit our Flex Learning page and our Credit Recovery Analysis page.